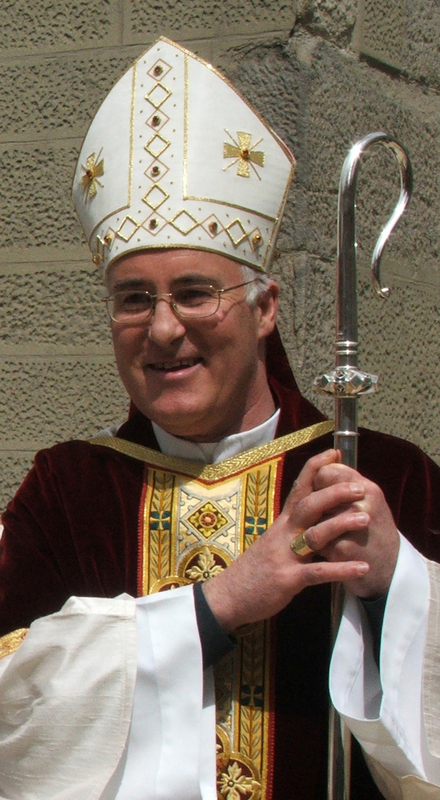 Bishop Kevin Dunn died on Saturday 1 March 2008 at the age of 57. Requiescat in pace. He was Bishop of Hexham and Newcastle from May 2004 until his death. Kevin Dunn was born in Newcastle-under-Lyme, Staffordshire, on July 9, 1950. He went to St. Mary's Primary School then on to St. Patrick's Secondary School in Newcastle-under-Lyme. He studied with the Salvatorian Fathers at Christleton Hall in Chester and studied A Levels at Coton College in North Staffordshire. He studied for the priesthood at Oscott College, Birmingham and was ordained to the priesthood at Our Lady and St. Werbergh's Church in Clayton, Newcastle under Lyme on 17 January 1976. He served in St. Patrick’s, Walsall, and was chaplain to Stuart Bathurst High School. He became chaplain to the Caribbean community in the Archdiocese of Birmingham from 1980 to 1987 where he lived in Aston, Birmingham (next door to Aston Villa football ground!). For two years he was parish priest at Our Lady of the Angels and St. Peter in Chains, Stoke-on-Trent. He was also chaplain to the Royal Infirmary, and chaplain to Staffordshire University. He underwent further studies at the Pontifical University of St. Thomas Aquinas (Angelicum) in Rome and was awarded a doctorate in Canon Law in 1991. (l - r) with Deacons at an ordination to the diaconate, following in the steps of St. Cuthbert in 2006 on a boat to the Farne Islands and at World Youth Day in Cologne in 2005. Upon his return to England in 1991, he worked as a parish priest in St. Austin's, Stafford and also lectured in Canon Law at Oscott College. During this time he became the Episcopal Vicar for religious in the Archdiocese of Birmingham. In 2001 he was also appointed full time Episcopal Vicar for the areas of Wolverhampton, Walsall, the Black Country and Worcestershire. In 2002 he became a Canon of the Metropolitan Chapter of St. Chad and a member of the Episcopal Council in the Archdiocese of Birmingham. The announcement of his appointment as Bishop of Hexham and Newcastle by His Holiness Pope John Paul II was made on 20 March 2004, the Feast of St. Cuthbert, patron of the Diocese. He was ordained Bishop of Hexham and Newcastle on 25 May 2004, the Feast of St Bede, at the Cathedral Church of St. Mary in Newcastle upon Tyne. At a Church Leaders Pilgrimage in Rome introducing ecumenical leaders to the Pope and at a Jubilee mass for the Little Sisters of the Poor. Bishop Kevin died at 9.30pm on Saturday 1 March 2008 in the Freeman Hospital, Newcastle upon Tyne, at the age of 57 after suffering from pneumonia. On Tuesday 11 March 2008 the Requiem for Bishop Kevin Dunn was celebrated in St. Mary's Cathedral followed by Burial in the Cathedral Crypt. The Principal Celebrant was the Most Reverend Patrick Kelly, Archbishop of Liverpool. He was joined by 32 Bishops, Archbishops, Cardinals and the Apostolic Nuncio and 245 priests and deacons from Hexham and Newcastle Diocese, Birmingham Diocese and other Dioceses. Also present were Civic Leaders and representatives, MPs and representatives from other faith traditions. Ecumenical representatives included the Bishop of Durham and the Bishop of Newcastle and representatives from many Christian Churches in the Diocese. With Alan Shearer at the opening of the Alan Shearer Centre and playing ecumenical golf.